More than 1,000 people from every region provided input into the Strategy, which identifies 190 societal actions aimed at achieving nine key goals: Celebrating Seniors; Financial Security; Health and Well-Being; Maximizing Independence; Housing Options; Transportation; Respecting Diversity; Employment and Life Transitions; and Supportive Communities. 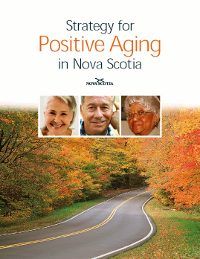 The Strategy for Positive Aging in Nova Scotia was released on December 13, 2005. The Strategy is a long-term guide to helping all sectors create senior-friendly communities and prepare for an aging population. Because the issues addressed in the Strategy cover virtually every aspect of society, a wide range of approaches and solutions are needed. The Strategy therefore ignores the boundaries that exist between each level of government, business, not-for-profit organizations, and community groups. Instead, it views the province as a whole and considers how all parts can work together in pursuit of a shared vision. Each month, 700 Nova Scotians turn 65. With seniors now numbering approximately 131,000 and expected to nearly double by 2026, it goes without saying that Nova Scotia is undergoing a demographic shift that will have a far-reaching impact on every facet of our society. In the Blueprint for a Better Nova Scotia (July 2003), the Government of Nova Scotia committed to establish a Task Force on Aging to create a Strategy to guide planning for an aging population. 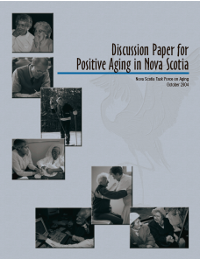 The Discussion Paper for Positive Aging in Nova Scotia was released in October, 2004. The Task Force used a unique approach to the consultation process by asking the public and stakeholders to critique and edit a draft framework - a more hands-on way of engaging citizens.